Spider-Man is one of the most beloved superheroes in the world for a reason – the ideals Peter Parker and the other people who’ve donned the Spider-mantle over the years have a reach that’s far and wide, and can be used to tell all kinds of different stories. But a new series out next year promises to tell one of the most intriguing tales yet. Superheroes, by and large, don’t age. Hell, sometimes they do, but it’s temporary, like Steve Rogers losing his supersoldier serum and temporarily becoming a fascist when he got it back (could’ve happened to any of us, really). Although the world around superheroes evolves and grows to match something akin to our own, these iconic figures stay fairly stagnant. Their status quos can change, and sometimes the march of time itself affects them in the slowest of manners – it could take them decades to move from their college freshman years to being in their mid-20s! – but otherwise, they’re stuck being the same as they were when they were introduced decades ago. There are few examples of this more prominent than Peter Parker, who has endured semi-stasis as a perpetual young man for so long, through so many resets, and so many setbacks to his early days, that we rarely get to see Spider-Man grow up. That is, until now. The full cover for Spider-Man: Life Story’s first issue. 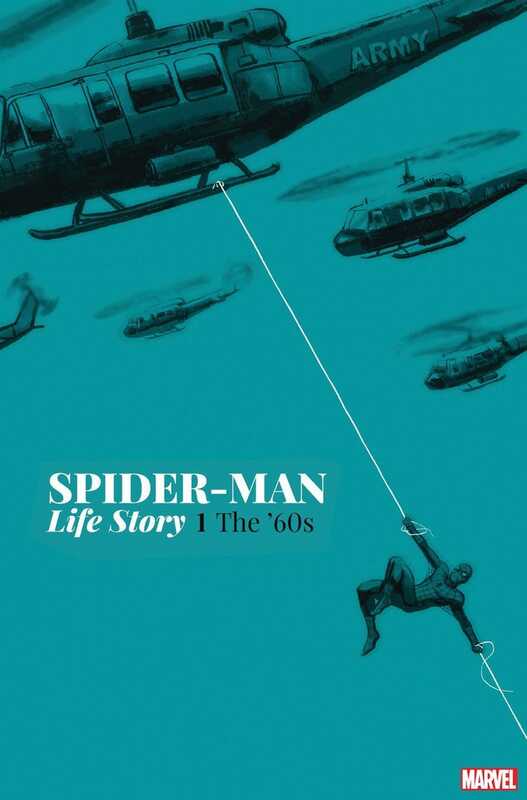 Comicbook.com reports that Marvel Comics today announced Spider-Man: Life Story, a new six-issue miniseries set to launch in spring 2019. Written by Chip Zdarsky (who recently concluded a truly remarkable run on Peter Parker, The Spectacular Spider-Man) and with art from Amazing and Ultimate Spider-Man’s Mark Bagley, Spider-Man: Life Story has a simple premise: Peter Parker became a superhero in 1962. What if we followed his entire life over six decades, as he grew up as the friendly neighbourhood Spider-Man in an ever-changing, ever-growing world? Not only will Life Story examine the act of Peter growing older over the course of its run, it won’t keep his exploits contained to the street-level superhero fights you might expect. The first issue, set in 1966, will see a young Peter tackle a grave test of his commitment to great power and great responsibility, as he wrestles with the United States entering the turmoil of the Vietnam War. The opportunity to watch a version of Peter Parker evolve and grow over such an extended period, while the world around him – along with the very idea of heroes and villains itself – grows ever more involved and complex, is almost unbearably promising, especially since it’ll be explored by two of the most exciting creative talents in recent Spidey history. Suffice to say, we’re already very excited for Spider-Man: Life Story #1 to hit shelves in March 2019.